Manchester, New Hampshire (CNN) - New Hampshire's largest newspaper has endorsed Newt Gingrich for the Republican presidential nomination. The New Hampshire Union Leader's Sunday editorial says the former House speaker "is by no means the perfect candidate" but calls him "the best candidate who is actually running." "Republican voters too often make the mistake of preferring an unattainable ideal to the best candidate who is actually running," writes the paper's publisher, Joe McQuaid. "In this incredibly important election, that candidate is Newt Gingrich. He has the experience, the leadership qualities and the vision to lead this country in these trying times." The Union Leader is the state's largest paper and its endorsement carries heft both locally and on a national scale, where it is seen as a bellwether for the nation's first primary. New Hampshire voters head to the polls Jan. 10. 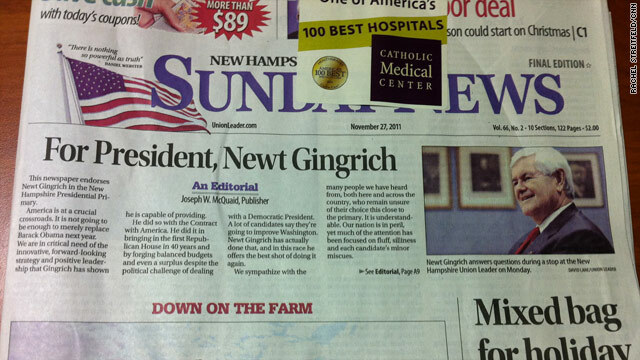 The paper's backing of Gingrich could help the former House speaker position himself as an alternative to former Massachusetts Gov. Mitt Romney in a state where Romney has long been considered the front-runner. He hovers around 40% in recent polls, while Gingrich surged to 14% in a Suffolk University poll conducted November 16-20. In an interview on CNN, Union Leader editor page editor Andrew Cline said the paper narrowed down the candidates to a choice between Gingrich and Texas Gov. Rick Perry. Cline said the paper picked Gingrich because he had the political experience to enact much of his platform. Cline said the board gave "a fresh start" to its consideration of Romney, who has long been a favorite to win New Hampshire’s primary, but who has been repeatedly challenged by the Union Leader's editorial page. “Romney's a guy who wants to be liked,” Cline said. “He's a politician who wants to be liked. Gingrich is a politician who wants to be respected, who wants to actually accomplish - he has an agenda that he wants to set in place. In the editorial, McQuaid praises Gingrich's "forward-thinking strategy" and the "positive leadership" he showed as House speaker. "A lot of candidates say they're going to improve Washington," he writes. "Newt Gingrich has actually done that, and in this race he offers the best shot of doing it again." On CNN's "State of the Union," Cline said electability wasn't the only factor in selecting a candidate to endorse. "We consider the candidate overall," Cline said. "I mean we don't just look at the poll numbers. This isn't a game where we're trying to win the primary so we can have a record of X-number of wins. We don't look at it that way. We are not trying to attach our name to a winner. That's not really leading. That would do our readers a very big disservice. We're looking at who we would like to see as president." Also a Gingrich, Huntsman ticket would be a formidable challenge to Obama, Biden. Glad to see NH backs those who dump their wives when they have cancer to run off with another woman. Another reason to never visit NH. All the morality of the GOP is fake. Oh, it's Gingrich this week? Next week it'll be...hmmm...maybe Huntsman? Doesn't matter. Obama will beat any of them without a problem. Hey morons the UNION is a NEWSPAPER!!!! NOT a labor union. "The paper endorsed Ronald Reagan in 1976 and 1980, Deleware [sic] Gov. Pete DuPont in 1988, Reagan aide Pat Buchanan in 1992 and 1996, businessman Steve Forbes in 2000, and Arizona Sen. John McCain in 2008." In other words, the paper has picked the correct candidate for the White House 1 times of of the past 7, giving it an 85% INACCURACY rate. So who cares what the editors of this paper think? The republicans got us into 2 unfunded wars, deregulated banking (leading to the housing and financial meltdown), passed an unfunded prescription drug plan and lowered taxes (the Bush tax cuts) so we had even less revenue. These disasters are why we are in financial trouble. Bill Clinton balanced the budget and George Bush spent it and then destroyed the economy. It will take the democrats 2 terms for Obama to fix this mess that the republicans caused.